There are three components to make the report. The first is a language called markdown. It’s meant as a simple language for writing basic text that will be turned into basic formatted HTML. It’s designed to look a lot like what people historically used in emails and online postings before HTML was widely used for that purpose. For example, to make a word italic, you would put asterisks around it *like this*. To make a title, you would type your title, then on the next line you’d “underscore” it with hyphens. To make a bullet list, you’d begin each line with an asterisk. And so on. You run the markdown file through a translator, and out comes HTML. 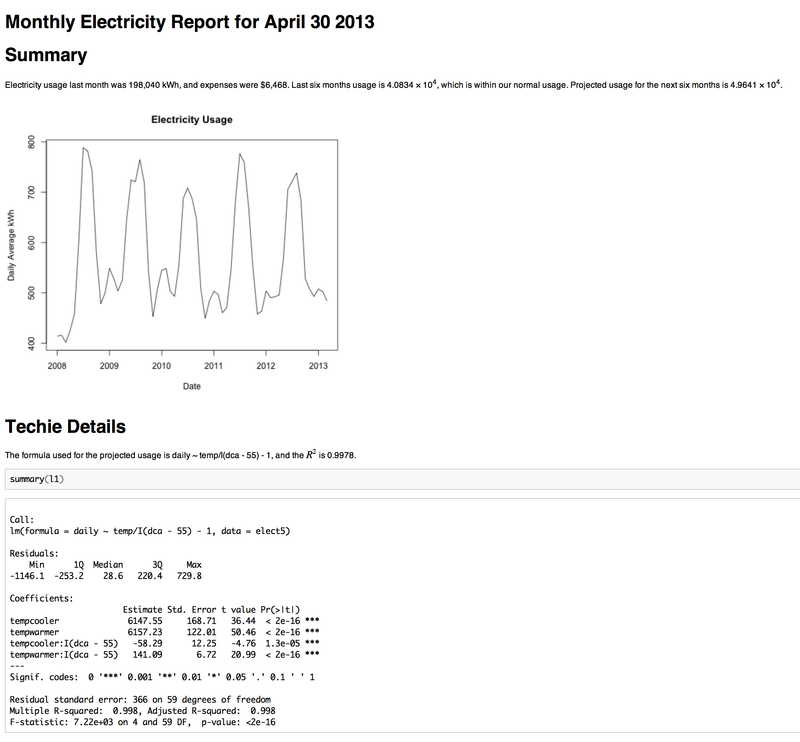 Electricity usage last month was `r format (tail (elect5$usage, 1), big.mark=",")` kWh, and expenses were \$`r format (tail (x2$Total.Current.Charges, 1), big.mark=",")`. Last six months usage is `r last_six`, which `r ifelse (usage.normal, "is within", "exceeds")` our normal usage. Projected usage for the next six months is `r pred`. The formula used for the projected usage is `r format (formula (l1))`, and the $R^2$ is `r summary (l1)$adj.r.squared`. Which is a reasonable start at a report that could be run automatically and emailed or uploaded to a website. Put the three parts together and you have a dynamically-generated report that can show just the results or can include the R code that was used to generate the results.